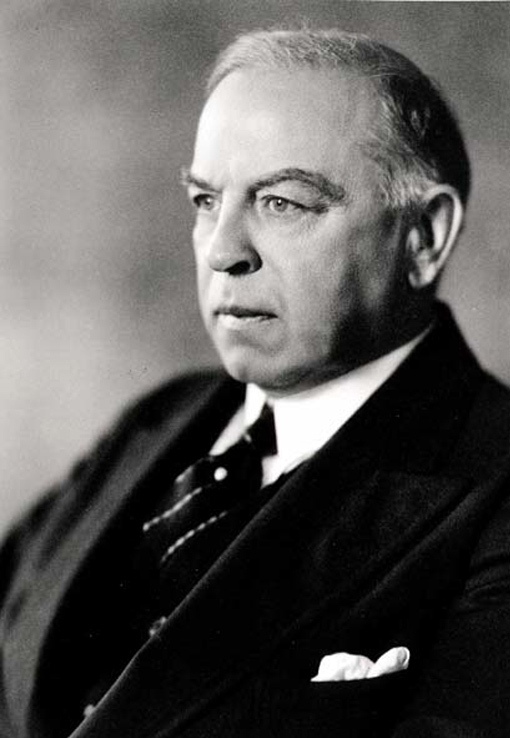 William Lyon Mackenzie King, born in Berlin (now Kitchener, Ontario) December 17, 1874, died in Kingsmere (Quebec) July 22, 1950. Leader of the Liberal Party from 1919 to 1948, Prime Minister of Canada from 1921 to 1926, from 1926 to 1930, and from 1935 to 1948. Right Honorable William Lyon Mackenzie King, 1941. National Archives of Canada, C-042725. The son of a lawyer, King was the grandson, on his mother’s side, of William Lyon Mackenzie, one of the leaders of the 1837 rebellion in Upper Canada. He studied law and economics at the University of Toronto (graduated in 1895), then at the University of Chicago (M.A., 1897). He went on to graduate studies at Harvard. In 1900, he becomes Deputy Minister in the newly created Department of Labour and entered the House of Commons in 1908 as Liberal Member of Parliament for North York. The following year, Sir Wilfrid Laurier appoints him Minister of Labour. Defeated in the 1911 elections, King works as a consultant in industrial relations, as well as for the Rockefeller Foundation. He publishes Industry and Humanity in 1918, a book in which he presents his vision of a government which, acting in the name of society as a whole, takes an active part in the peaceful solution of labour disputes. At their 1919 congress, the Liberals choose King as leader. An experienced negotiator, King restores the internal unity of the party and leads it to victory in the 1921 elections. During those years of economic prosperity King is able to reduce the war debt and creates an old age pension plan. He fails however to realize the scope of the coming economic crisis and to take appropriate measures. In 1930, Canadian electors give the power to the Conservative Party of R. B. Bennett. The Tories are unable to provide solutions to the deepening economic crisis or to alleviate the social woes of the country and King is reinstated in 1935. The liberal government as well proves powerless to come up with economic solutions to the Great Depression; from 1937, the situation gets increasingly worse and the cost of social welfare measures rise. But now, King’s attention is focused on the successive crises that herald the possibility of a new European war. A conciliator at heart, King favours dispute settlement through negotiation and, accordingly, supports the French and British appeasement strategy. When war breaks out with the August 1939 invasion of Poland by the Nazis, King calls up an extraordinary session of the Parliament and proposes that Canada proclaim the state of war. From that date, the government, business people and workers cooperate to transform Canadian industry and to adapt it to the required war effort. 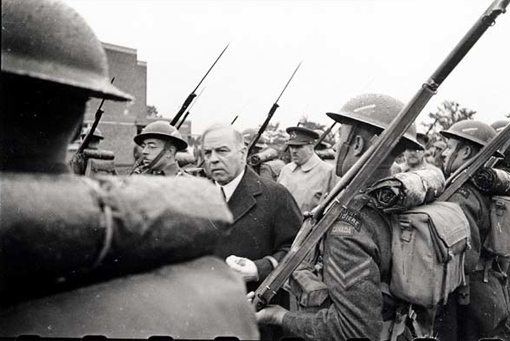 Mackenzie King knows that conscription is likely to divide the country and render French Canadians hostile to the war effort. Supported by Justice Minister Ernest Lapointe, he promises that there will be no conscription of Canadians. But the demand for military personnel increases as war goes on. In 1940, conscription is introduced for territorial defence, but not for overseas service. In 1942, King asks Canadians to release the government from its promise and to allow conscription for active duty, if circumstances call for it. Despite the positive answer provided by the 27 April 1942 referendum, King will wait until the end of 1944, following the high number of casualties in Normandy, before allowing that men who were not volunteers be sent to the front. All along, King prepares the post-war period and sets in place measures to avoid an economic relapse. Unemployment insurance is introduced in 1940. The national debt is brought under control, a national child benefits plan is created, as well as mechanisms for the reintegration of veterans into civilian life. Once the war is over though, King restricts the role of government both on the local and international scene. Prime Minister W.L. Mackenzie King inspecting guard of honour from the Régiment de la Chaudière, Redhill, England, 1 July 1941. Photo by Laurie A. Audrain. Department of National Defence / National Archives of Canada, PA-152440. Canadians have criticized King for his lack of creativity, for being a respectable but dull statesman. Indeed he did not have the charisma of Churchill or Roosevelt and was not one who could inflame crowds or troops. He was, however, able to lead Canada through a titanic struggle. His ceaseless activity as a negotiator allowed him to maximize Canada’s war effort, while ensuring that Canadian interests were served before those of Great Britain. He preserved Canada’s territorial security and was instrumental as a negotiator in bringing together the two major Allied powers, the USA and Great Britain. Finally, he ensured the welfare of Canadians during and after the war. I never dreamed that the day would come when, after spending a lifetime in a continuous effort to promote and to preserve peace and good-will, in international as well as in industrial relations, it should fall to my lot to be the one to lead this Dominion of Canada into a great war. But that responsibility I assume with a sense of being true to the very blood that is in my veins. I assume it in the defence of freedom—the freedom of my fellow-countrymen, the freedom of those whose lives are unprotected in other countries, the freedom of mankind itself. — W.L. Mackenzie King, House of Commons, 8 September 1939.